Ok, guys! This is my last convention review of the year! Then I promise I’ll write about other things besides how much fun I have geeking out with other nerds. Geek Media Expo is here in Nashville, TN and I’ve been attending since it began in October 2009. It’s your basic sci-fi, gaming, fantasy and general geek convention, but it has a special place in my heart as it was not only my first non-anime convention, but it was also the place I found my people. If you haven’t read my Speak Out With Your Geek Out post over on Space Gypsies, check that out here. So it’s all come full circle for me – my first year in the convention circuit. But before I get all sentimental and off track, let’s get back to GMX. This year’s convention featured a wide array of programming including a steampunk exhibition, gaming stars, and even 80’s icons. What The Cast, a popular geek comedy podcast hosted by the folks behind Dragon*ConTV, recorded its 100th show live at the event. Check that out here. The weekend was saddened, however, by the recent passing of one of its most well known members, Ryan Jones. 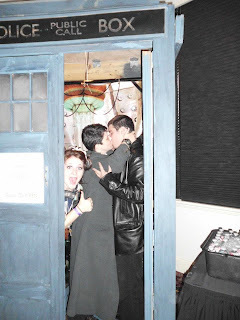 Ryan was an active member of the 501st Legion and the spitting image of David Tennant when dressed as the Tenth Doctor. Ryan’s Army, an organization helping raise money for his medical treatment, hosted a memorial service Saturday afternoon. People from all over attended to celebrate the life of this amazing young man and remember his impact on the geek community. 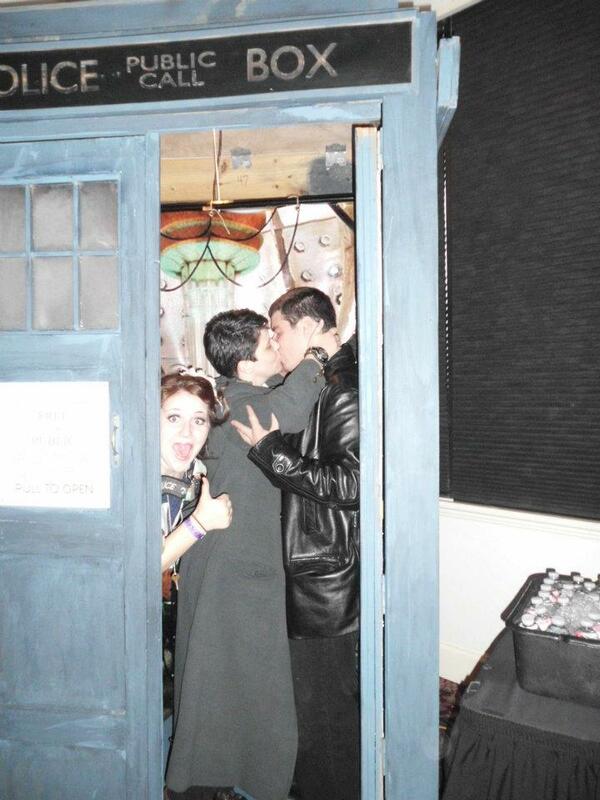 The TARDIS ships it, and so do you. The room where the service was held was the meeting place for Whovians throughout the weekend, as it housed a locally built TARDIS; the same one you might have seen at Dragon*Con. It certainly added flavor to my favorite event of the weekend which was the Rift Rapture Waltz, a 1940s themed dance featuring a live swing band. All kinds of geek media happens in the 40s – Call of Duty, Bioshock, even episodes of Torchwood and Doctor Who. Classic World War II posters decorated the walls and contestants from GMX’s Miss Pin Up Contest swung their way across the floor. There was even a combined performance by Samantha Newark of Jem and the Holograms and 80’s pop idol Tiffany. I almost thought the boys really might be going to war! 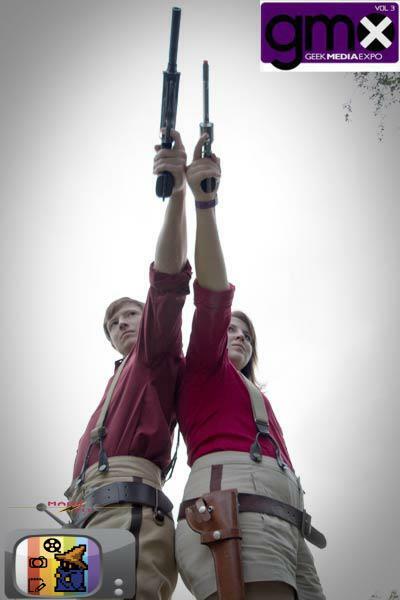 Bob and Carl: Sci-Fi Janitors made an appearance, as did Ellen McLain, (voice of GLaDOS in the video games Portal and Portal 2), and the Apparition Abolishers, a group of steampunk costumers and prop makers. They’re sort of a steampunk version of the Ghostbusters, if you couldn’t already tell. The Apparition Abolishers hosted a steampunk exhibition, featuring “curious contraptions and fantastical oddities,” and the “Clocktease Burlesque Show.” For more on the Apparition Abolishers and all the steampunk sights they have to offer, go here. As with Dragon*Con, GMX is definitely a party convention. 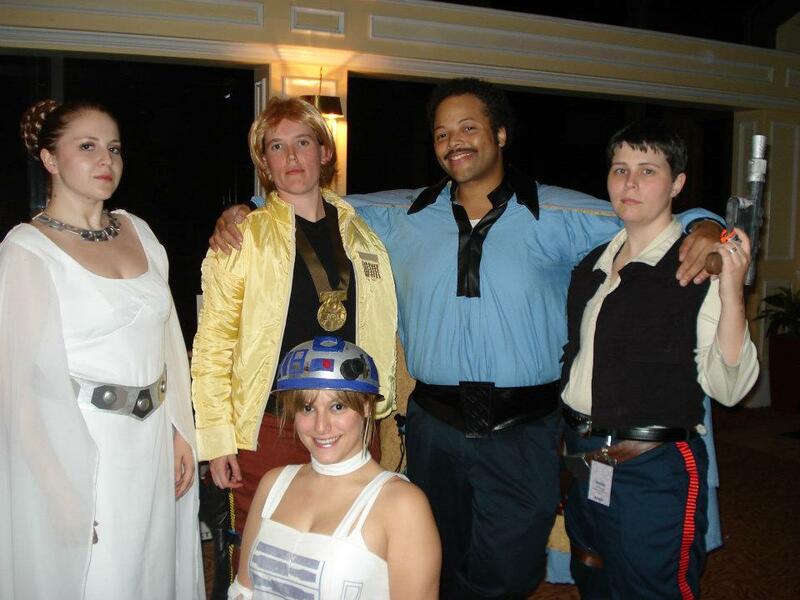 The 501st hosted their usual amazing shindig, as did Momocon. If you missed the parties, you simply weren’t looking hard enough! Finding some of the panels, though, was another story. This was GMX’s first year at the Milennium Maxwell House Hotel, and I pray it’s their last. It’s a ten story hotel, with the main ballroom on the tenth floor. That’s all well and good, except all other panels are split between the first and second floors, making the elevator experience reminiscent of the Hyatt at Dragon*Con. Well, maybe it wasn’t all that bad, but it certainly wasn’t pleasant, especially with the stairs only allowing entry to the 3rd and 5th floors. Those arriving early to events in the 10th floor ballroom were forced to wait in the tiny 10th floor lobby, and were soon backed into the elevators, making the line for that event continue all the way down on the 1st floor. It was…chaos, to say the least. One of the things I’ve enjoyed best about GMX in recent years is that it is a small convention. It has, until this year, been held in the Opryland Radisson, a three story hotel with the main ballroom as a central lobby area. All rooms opened onto the main space. This made for easy access to panels and parties, because all one had to do was look around the walls and see where people were congregating. I don’t know all the details about why GMX left the Opryland Radisson, but I ask them to remember that the layout of the convention hotel matters. Some hotels are simply ill equipped to host a science fiction convention, and the Milennium Maxwell House is one of them. Dragon*Con will. It’s a good way to round out the convention season because it’s really what you make it. You can treat it as a relaxicon and have just as much fun as someone who attends panels all weekend. This year’s convention had some super guests, awesome events, and up-all-night parties, with attendance increased dramatically from last year. If you live anywhere near Nashville, definitely add it to your list for next year, because I only see it growing. I’ll be there, and so will all the cool kids! Also, check out this great video footage my friend Gregg took at GMX!